Tanya Haber, DO, is board certified in osteopathic internal medicine with advanced osteopathic medical examiner’s training. She received her medical degree from Michigan State University and completed her residency at Genesys Regional Medical Center. Dr. Haber has over 15 years of clinical experience in internal medicine, chronic disease management, acute illness treatment and management, whole-person health exams, urgent care and preventive medicine. She was previously the program director of internal medicine at several university hospitals, as well as a clinical instructor and assistant professor. 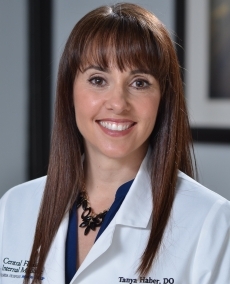 She is a recipient of the Outstanding Teacher Award from the University of Miami and of the American College of Osteopathic Internists Fellowship. Dr. Haber will do whatever it takes to help her patients. Note:- The list below is for reference purposes only and is subject to change. Please check with your health plan to confirm that Tanya Haber, DO is included before scheduling an appointment.